I first realised about three or four years ago that photocopiers had fallen out of favour: that what were previously very expensive machines were being almost given away. The reason? They’ve been superseded with PC scan-and-print, and the high cost of replacement cartridges often makes them uneconomic. In short, in many cases technology has overtaken the original design. So, I wondered, what’s inside a photocopier? I picked one up very cheaply and then pulled it apart. Then another – then another. I soon realised that there’s heaps of good stuff inside these machines, so I started keeping half an eye on eBay, looking just for the machines being auctioned locally for under AUD$5. Under five bucks? ! Yep. One day, I saw a huge Kodak machine being eBay’d for nearly nothing. It must have cost many tens of thousands of dollars – perhaps over $100,000 – when new, but I got it for literally a few coins. I went to the vendor’s location with 6 x 4 trailer and a portable engine crane, but – incredibly – the machine was too large and heavy to even get it on the trailer. But the vendors (who sold photocopiers and had taken it as a trade-in) were happy for me to come back another day and pull it apart in situ. All they wanted was for it to be disassembled enough that they could physically lift it into their scrap skip! I returned a week or so later, armed with my tools. Working in the hot warehouse out the back of the shop, I spent about five hours pulling out motors, gearboxes, fans, power supplies, electrical filters, axles, gearboxes, huge heavy duty castors – it went on and on. And – get this! – I then turned around and eBay’d many of the parts, selling them as generic mechanical and electronic components. Even choosing to keep a lot of stuff for my own use, that 4-5 hours of (interesting) work made for me many hundreds of dollars. Now the enormous Kodak was an unusual machine, and the quality of parts I extracted from it was unusually high. 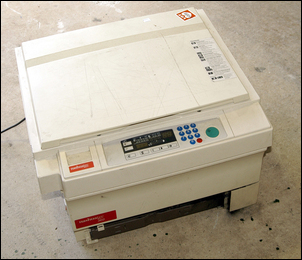 But almost any photocopier is worth grabbing and pulling apart – that is, if you can get it really cheaply. As with all these sorts of stories, if you hate getting your hands dirty, and don’t have on the shelf lots of little containers of treasured screws and nuts and springs and wire (and...) then this article is sure not for you! So what bits and pieces can you get out of a typical photocopier? The quality and number of useful components depends a lot on the specific photocopier. Unfortunately there’s no way of knowing what you’ve got until you pull it apart. Some have as many five DC brushless fans – but some have only two. 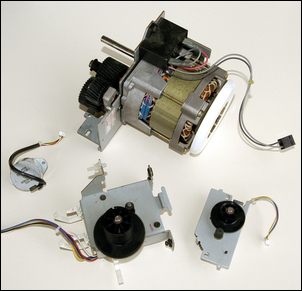 Some photocopiers have large DC stepper motors – but other use synchronous AC motors which are much less useful. So taking all that into account, don’t pay more than AUD$5. Inside all photocopiers you’ll find lights. The lights – high voltage, high power incandescent filament bulbs – are used to both illuminate the material to be copied and also as a heater to cook the toner as the photocopied sheets are on their way out of the machine. The latter light often includes an over-temp switch mounted nearby. In addition, you’ll sometimes find rows of mains-powered neons and/or rows of low-voltage LEDs. Fans consist primarily of conventional PC-type fans (although often running on 24V – but they’ll work down to 12V without problems) but sometimes if you get lucky, you’ll find a bunch of squirrel-cage fans of the sort that flow a lot of air very quietly. I use one of these in my self-built home audio amplifier. The squirrel cage fans are most often AC mains-powered but a few work on 24V DC. You can also be guaranteed of finding an excellent quality lens (typical focal length: 180mm). The lenses are razor sharp and make ideal hand magnifying glasses – they’re also large and bright and some are coated for better light transmission. 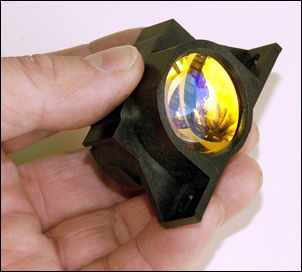 These lenses make a normal magnifying glass (or even quality hand lens) look really poor – ex-photo copier lens are really high quality items. I use one as my normal magnifying glass. Inside every photocopier you’ll also find mirrors – anywhere from one to four. The mirrors are front-faced (ie not silvered on the back of the glass, as most mirrors are) and of a length that corresponds to the width of the photocopy area. Typically, they’re 10 to 20mm wide, so they’re long and narrow. To be honest I haven’t found a lot of use for them (except, oddly enough, winding high powered resistors on them!) 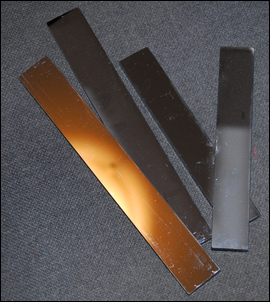 but if you’re into lasers or other optical systems and need a very low cost, high quality mirror, they’re plenty waiting for you to collect! Even if the photocopier’s main transport system is powered by an AC motor, there will still be a few low voltage stepper motors (the bottom three motors in pic). For example, if the copier uses a document feeder, there’ll be a stepper buried in that part of the machine. However, occasionally you stumble across gold – huge stepper motors (as big as a man’s fist) with built-in reduction gearboxes. These are highly prized (and if you don’t want them, you can make a good profit eBaying them) and can be used to drive robots or 3-axis milling machines, or driven backwards as really grunty human-cranked alternators. With the right driver electronics, some are powerful enough to push a bicycle. 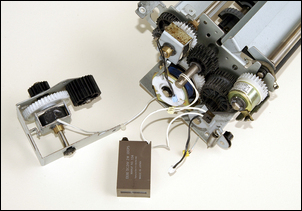 The geared AC motor pictured here (top) has an output shaft speed of just 53 rpm, making it ideal for spinning an advertising sign or the like. 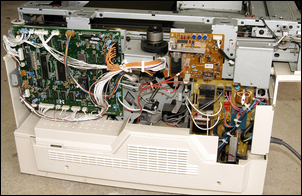 Note that most of the extensive gear-train you’ll find inside a copier cannot be extracted whole – not unless you keep the complete chassis intact. Instead, look for sub gear assemblies that mount on separate baseplates. 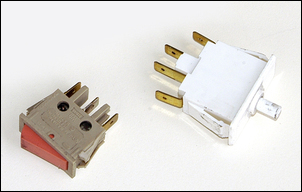 There are two completely different classes of switches that you’ll find in a copier. 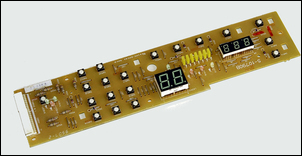 The most numerous are the tiny tactile PCB-mounted press-buttons mounted behind the membrane keypad. If these are extracted from the PCB by using a heatgun directed at the solder side while a pair of pointy-nosed pliers is used to pull them out, a lot can be salvaged in a very short time. 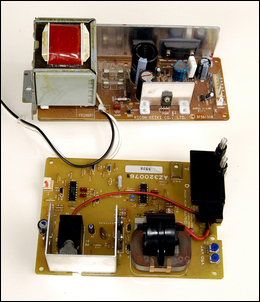 There will also be another pair of switches of very different current rating – the main on/off switch (normally on the back of the photocopier), and a pushbutton switch that goes open-circuit when the top half of the copier is pivoted up for repair or toner replacement. The latter two switches are definitely worth salvaging – they are heavy duty with typical ratings of 16A at 250V. I used the momentary switch from a photocopier as the trigger switch in my hand-held 12V drill (see Portable Light-Weight Drill). It sounds a bit of a non-event but in practice I’ve found it extremely useful. What’s that then? 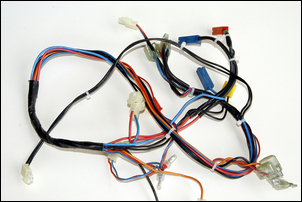 Most copiers have a series of wiring looms running around inside. Some looms are made of the same colour, thin wires – and I throw those sway. But others are much heavier in current rating and use a wide variety of individual colours. They are just the thing when you want to a short length of electrical wire. The wide variety of colours reduces confusion and it saves you having to buy reels of different colour hook-up wire. Instead, just reach into the box of discarded looms and snip off short lengths! Think ‘photocopiers’ and you’re probably immediately thinking of high voltage power supplies. After all, photocopiers use kilovolts inside! However, while the power supplies are able to be salvaged (most copiers have at least two individually packaged high voltage power supplies), I am not sure that they’re a lot of practical uses for a power supply with an output of 5kV at 290uA! There’s also usually a conventional linear power supply, typically providing 5.2V at 0.4A and 1.6A at 24V. If you decide to strip these rather than use them whole, you’ll find a range of medium and small aluminium heatsinks that are easily removed. Finally, there’s a whole lot of hardware. 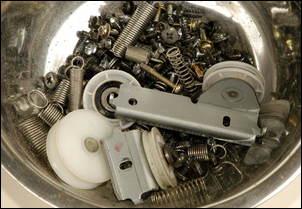 The fold-down lid often uses snap-action two-position hinges, there are hundreds of machine screws, many springs, pulleys, cables and toothed belts, and a bunch of cogs and gears. There’s also something potentially even more useful – painted or plated sheet metal brackets and panels. These are ideal if you need to construct custom brackets or similar. And don’t forget the glass: it’s usually very easy to remove (do it first when there’s less chance of breaking it!). When you’re pulling apart a photocopier, keep a few cautions in mind. 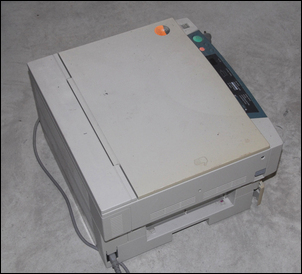 Disassemble the copier outside while wearing old clothes – most often, toner will get everywhere. Some copiers use torsion bar springs to counterbalance the weight of the open top half – these springs are very powerful and if you undo their retaining screws while they’re under tension, they can fly out. 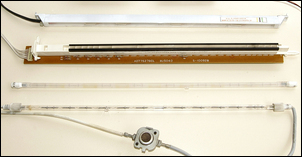 (Other copiers use small gas struts – another excellent salvage part.) The high voltage power supplies have on-board capacitors that could give a nasty bite – they’ll be fine if the copier hasn’t been powered-up recently, but in general don’t handle these power supplies with bare hands. This list of parts hasn’t been exhaustive – I haven’t mentioned the LED displays, the electro-mechanical counter, the electric clutches, bearings, or shafts. In short, there are usually plenty of good bits to salvage.